UPDATE: can you believe it is the second week of the Morgana CAL already? I was going give prizes at the end for randomly chosen participants, but why not do it every week? I'll give everyone a chance to pop into the Ravelry group and post either a photo of the yarn they chose, or a photo of their initial progress through this weekend. And I'll randomly choose a winner. Each week going forward I'll randomly choose a winner from the posts and progress photos. And there will be a final winner chosen from finished photos at the end. Sound fun, right? Head over to the Morgana CAL threadon the Kristin Omdahl Community Group on Ravelryto participate! I am happy to announce that the Morgana Crochet Shawl Crochet-ALong (CAL) Week 1 is finally here! After much discussion on Yarn on the Beach podcast, I feel the one social media website that everyone seems to be active and willing to participate is Ravelry. I wanted to make sure this event is an inclusive as possible. If you would like to join and are not a member of Ravelry, please leave me a comment. I will be hosting the Crochet Along on my Kristin Omdahl Community Ravelry Group Page. Please feel welcome to talk about the pattern, post your photos, and see everyone else's photos, too! I can't wait to see everyone's color choices! It can be done in one color, 2 colors, 3 colors; it can be done with the same size yarn and hook; or you could modify your colors and yarn weight to make the shawl bigger or smaller! The chart and written instructions are easy to follow, and even easier to follow along with a video tutorial series here. I look forward to seeing everyone's photos! 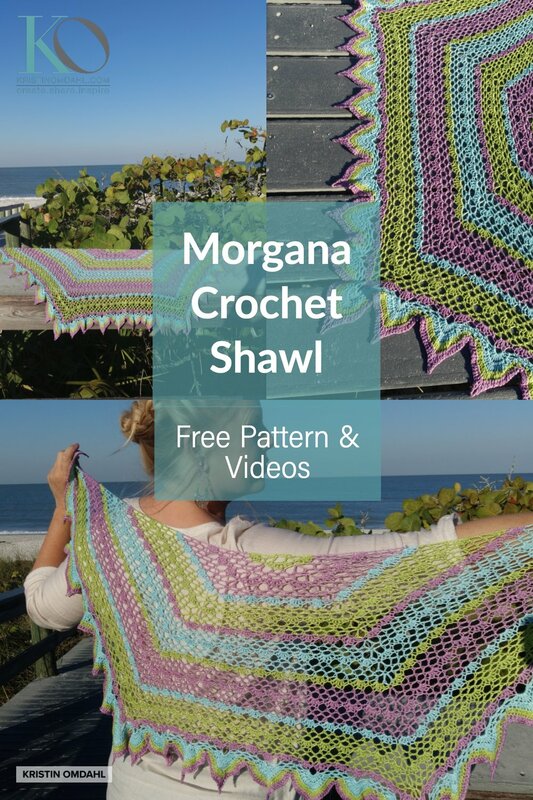 Click here for the Morgana Crochet Shawl Post to learn how to download the free pattern, watch the 9-part step by step video tutorial, and order your yarn.